What are the chances that an elementary school teacher and her former student would be living in the same retirement community? It was recently discovered that Lola Glass of Chestnut Cluster was the first-grade teacher of Barbara Molesworth of Quince Cluster. Lola’s husband, Larry, met Barbara at a Pine Run “Keep on Learning” presentation about Doylestown’s Intelligencer reporter W. Lester Trauch. Larry and Barbara were both looking at a photo of the old Doylestown Public School – which was located at East Court and Broad Streets. 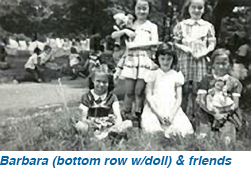 Barbara said that she had gone to elementary school there and Larry said that Lola taught first grade at the school before they were married. They were astonished to discover that Miss Lola Deibert had been Barbara’s first grade teacher! Lola grew up in Danville, PA and was a 1952 graduate of Bloomsburg College where she earned a teaching degree. A Doylestown school superintendent was recruiting teachers, and because Lola wanted to live closer to a city and to her current boyfriend/future husband, Larry, who was living in Germantown, she accepted a position. Lola had 33 students and no teacher’s aide. Because Lola enjoyed singing and playing the piano and organ, she occasionally taught the children in her class new songs, and when she had recess duty, she taught them new games. When the children were restless in her class, she would lead rousing games of “Simon Says” to expend their excess energy so they would be able to focus on schoolwork once again. By February 1953, Lola was engaged to Larry and near the end of the school year, the principal took suggested that perhaps Lola should be considering a new career path such as business. Lola married Larry in July and went to business school in September, but ultimately enjoyed life as a homemaker, mother of three kids, and more than 30 years as a church organist and choir director. Barbara finished sixth grade at the Borough elementary school and continued her schooling at Lenape Junior High School and Central Bucks High School. She graduated from Empire Beauty School in Allentown and had a successful, nearly 40-year career as the owner and operator of Cross Keys Beauty Salon. Barbara met her husband Bob in 1964 while she was working at Ed’s Diner in Doylestown, they were married the following year, and enjoyed 50 wonderful years of marriage.